Universal is an Italian restaurant in the heart of Lygon Street and a 10 minute walk away from my university building! The restaurant is quite big and spacious. It also provides outdoor dining and there is an upstairs function room for parties and corporate events. Universal fills up fairly quickly, despite the extensive space so its pretty popular. However when it is packed, the restaurant becomes unbearably loud (I prefer a much quieter environment). The staff were quite friendly and I noticed a couple of workers making conversation with some of the diners. Half and Half Pizza (small 4 slices pizza $10.90 + capsicum 0.70c + half and half 0.50c = $12.10) – half BBQ chicken (tomato, cheese, chicken, mushroom, onion & BBQ sauce), half capriciosa w/ capsicum (tomato, cheese, ham, mushroom & olives). N asked for no olives but they still gave her olives. There was also a huge miscommunication because she wanted The Lot pizza excluding 4 of its toppings and said “like a capriciosa but with capsicum” and so they wrote the order as “capriciosa + capsicum” which resulted in a surcharge of 0.70c. It may not sound much but hey, it’s still money! Tuscan Chicken ($18.90) – grilled chicken breast fillet marinated in their tuscan inspired herb & spice mix, served with wild mushroom risotto. Iced Chocolate w/ Vanilla Ice-Cream ($6) – Universal is so generous with their portions! 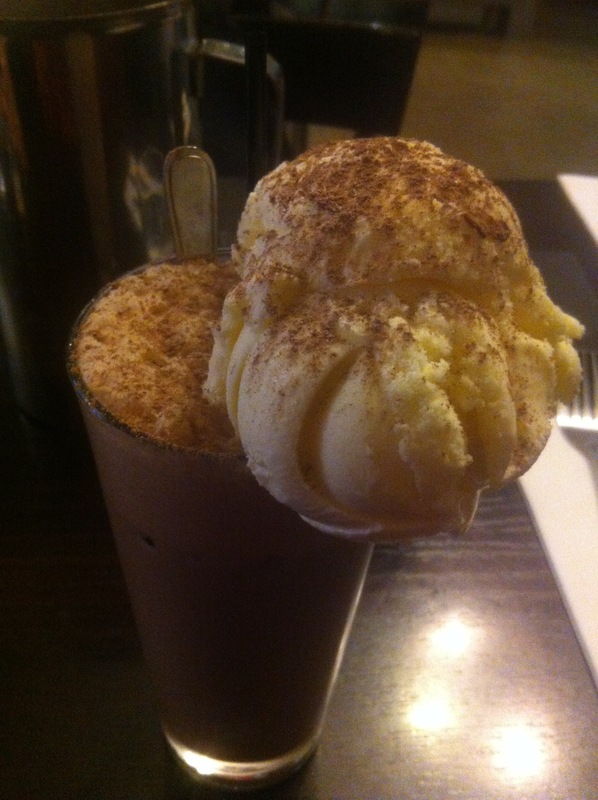 Pretty big glass of iced chocolate with a huge scoop of ice-cream on the side. The icecream is a bit hard to eat though because of its position and the possibility of it melting really quickly so I had to grab my spoon and push it into the glass. You can kind of taste the cocoa powder at times but it’s okay if you keep mixing it. Quite nice, not too sweet and I love the vanilla ice-cream; it is creamy with a strong vanilla taste! 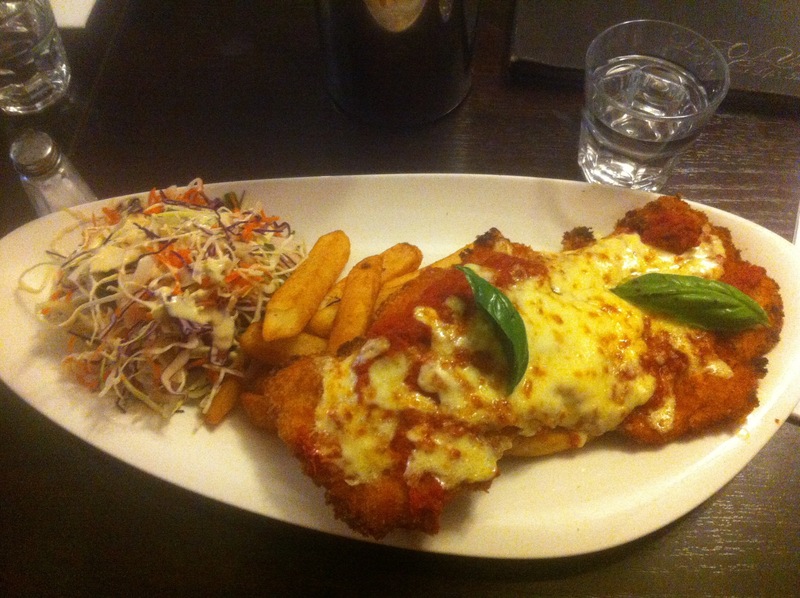 Chicken Parmigiana ($14) – home made chicken breast schnitzel w/ napolitana sauce & mozzarella cheese served with beer battered chips & salad.